Kazimir Severinovich Malevich[nb 1] (February 23 [O.S. 11] 1879 – May 15, 1935) was a Russian avant-garde artist and art theorist, whose pioneering work and writing had a profound influence on the development of non-objective, or abstract art, in the 20th century. Born in Kiev to an ethnic Polish family, his concept of Suprematism sought to develop a form of expression that moved as far as possible from the world of natural forms (objectivity) and subject matter in order to access "the supremacy of pure feeling" and spirituality. 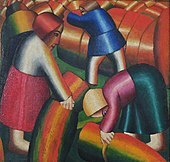 Malevich is considered to be part of Ukrainian avant-garde together with Alexander Archipenko, Vladimir Tatlin, Sonia Delaunay, Aleksandra Ekster, David Burliuk that was shaped by Ukrainian born artists who worked first in Ukraine and later over geographical span between Europe and America. Early on, Malevich worked in a variety of styles, quickly assimilating the movements of Impressionism, Symbolism and Fauvism, and after visiting Paris in 1912, Cubism. Gradually simplifying his style, he developed an approach with key works consisting of pure geometric forms and their relationships to one another, set against minimal grounds. 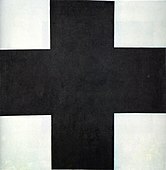 His Black Square (1915), a black square on white, represented the most radically abstract painting known to have been created so far and drew "an uncrossable line (…) between old art and new art"; Suprematist Composition: White on White (1918), a barely differentiated off-white square superimposed on an off-white ground, would take his ideal of pure abstraction to its logical conclusion. In addition to his paintings, Malevich laid down his theories in writing, such as "From Cubism and Futurism to Suprematism" (1915) and The Non-Objective World: The Manifesto of Suprematism (1926). Malevich's trajectory in many ways mirrored the tumult of the decades surrounding the October Revolution (O.S.) in 1917. In its immediate aftermath, vanguard movements such as Suprematism and Vladimir Tatlin's Constructivism were encouraged by Trotskyite factions in the government. Malevich held several prominent teaching positions and received a solo show at the Sixteenth State Exhibition in Moscow in 1919. His recognition spread to the West with solo exhibitions in Warsaw and Berlin in 1927. Upon his return, modern art was falling out of favor with the new government of Joseph Stalin. 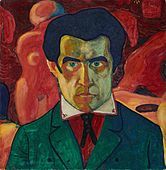 Malevich soon lost his teaching position, artworks and manuscripts were confiscated, and he was banned from making art. In 1930, he was imprisoned for two months due to suspicions raised by his trip to Poland and Germany. Forced to abandon abstraction, he painted in a representational style in the years before his death from cancer in 1935, at the age of 56. Kazimir Malevich was born Kazimierz Malewicz to a Polish family, who settled near Kiev in Kiev Governorate of the Russian Empire during the partitions of Poland. His parents, Ludwika and Seweryn Malewicz, were Roman Catholic like most ethnic Poles, though his father attended Orthodox services as well. They both had fled from the former eastern territories of the Commonwealth (present-day Kopyl Region of Belarus) to Kiev in the aftermath of the failed Polish January Uprising of 1863 against the tsarist army. His native language was Polish, but he also spoke Ukrainian. Malevich would later write a series of articles in Ukrainian about art. Kazimir's father managed a sugar factory. Kazimir was the first of fourteen children, only nine of whom survived into adulthood. His family moved often and he spent most of his childhood in the villages of modern-day Ukraine, amidst sugar-beet plantations, far from centers of culture. Until age twelve he knew nothing of professional artists, although art had surrounded him in childhood. He delighted in peasant embroidery, and in decorated walls and stoves. He was able to paint in the peasant style. He studied drawing in Kiev from 1895 to 1896. From 1896 to 1904 Kazimir Malevich lived in Kursk. In 1904, after the death of his father, he moved to Moscow. He studied at the Moscow School of Painting, Sculpture, and Architecture from 1904 to 1910 and in the studio of Fedor Rerberg in Moscow. In 1911 he participated in the second exhibition of the group, Soyuz Molodyozhi (Union of Youth) in St. Petersburg, together with Vladimir Tatlin and, in 1912, the group held its third exhibition, which included works by Aleksandra Ekster, Tatlin, and others. In the same year he participated in an exhibition by the collective, Donkey's Tail in Moscow. By that time his works were influenced by Natalia Goncharova and Mikhail Larionov, Russian avant-garde painters, who were particularly interested in Russian folk art called lubok. Malevich described himself as painting in a "Cubo-Futuristic" style in 1912. In March 1913 a major exhibition of Aristarkh Lentulov's paintings opened in Moscow. The effect of this exhibition was comparable with that of Paul Cézanne in Paris in 1907, as all the main Russian avant-garde artists of the time (including Malevich) immediately absorbed the cubist principles and began using them in their works. Already in the same year the Cubo-Futurist opera, Victory Over the Sun, with Malevich's stage-set, became a great success. 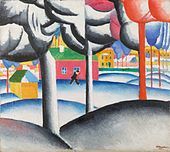 In 1914 Malevich exhibited his works in the Salon des Indépendants in Paris together with Alexander Archipenko, Sonia Delaunay, Aleksandra Ekster, and Vadim Meller, among others. Malevich also co-illustrated, with Pavel Filonov, Selected Poems with Postscript, 1907–1914 by Velimir Khlebnikov and another work by Khlebnikov in 1914 titled Roar! Gauntlets, 1908–1914, with Vladimir Burliuk. Later in that same year he created a series of lithographs in support of Russia’s entry into WWI. These prints, accompanied by captions by Vladimir Mayakovsky and published by the Moscow-based publication house Segodniashnii Lubok (Contemporary Lubok), on the one hand show the influence of traditional folk art, but on the other are characterised by solid blocks of pure colours juxtaposed in compositionally evocative ways that anticipate his Suprematist work. 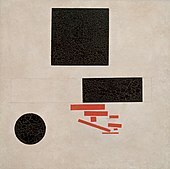 Malevich exhibited his first Black Square, now at the Tretyakov Gallery in Moscow, at the Last Futurist Exhibition 0,10 in Petrograd (Saint Petersburg) in 1915. A black square placed against the sun appeared for the first time in the 1913 scenic designs for the Futurist opera Victory over the Sun. The second Black Square was painted around 1923. 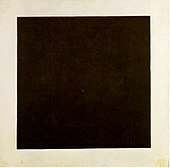 Some believe that the third Black Square (also at the Tretyakov Gallery) was painted in 1929 for Malevich's solo exhibition, because of the poor condition of the 1915 square. One more Black Square, the smallest and probably the last, may have been intended as a diptych together with the Red Square (though of smaller size) for the exhibition Artists of the RSFSR: 15 Years, held in Leningrad (1932). The two squares, Black and Red, were the centerpiece of the show. This last square, despite the author's note 1913 on the reverse, is believed to have been created in the late twenties or early thirties, for there are no earlier mentions of it. Some Ukrainian authors argue that Malevich's Suprematism is rooted in the traditional Ukrainian culture. In 1923, Malevich was appointed director of Petrograd State Institute of Artistic Culture, which was forced to close in 1926 after a Communist party newspaper called it "a government-supported monastery" rife with "counterrevolutionary sermonizing and artistic debauchery." The Soviet state was by then heavily promoting an idealized, propagandistic  style of art called Socialist Realism—a style Malevich had spent his entire career repudiating. Nevertheless, he swam with the current, and was quietly tolerated by the Communists. In 1927, Malevich traveled to Warsaw where he was given a hero's welcome. There he met with artists and former students Władysław Strzemiński and Katarzyna Kobro, whose own movement, Unism, was highly influenced by Malevich. He held his first foreign exhibit in the Hotel Polonia Palace. From there the painter ventured on to Berlin and Munich for a retrospective which finally brought him international recognition. He arranged to leave most of the paintings behind when he returned to the Soviet Union. Malevich's assumption that a shifting in the attitudes of the Soviet authorities toward the modernist art movement would take place after the death of Vladimir Lenin and Leon Trotsky's fall from power was proven correct in a couple of years, when the government of Joseph Stalin turned against forms of abstraction, considering them a type of "bourgeois" art, that could not express social realities. As a consequence, many of his works were confiscated and he was banned from creating and exhibiting similar art. In 1930 he was interrogated by the KGB in Leningrad, accused of Polish espionage, and threatened with execution. Russian art historian Irina Vakar   gained access to the artist’s criminal case and found that Malevich called himself a Ukrainian. He was imprisoned for three months. Critics derided Malevich's art as a negation of everything good and pure: love of life and love of nature. The Westernizer artist and art historian Alexandre Benois was one such critic. Malevich responded that art can advance and develop for art's sake alone, saying that "art does not need us, and it never did". When Malevich died of cancer at the age of fifty-seven, in Leningrad on 15 May 1935, his friends and disciples buried his ashes in a grave marked with a black square. 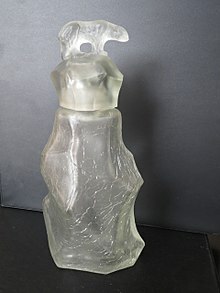 They didn’t fulfill his stated wish to have the grave topped with an "architekton"—one of his skyscraper-like maquettes of abstract forms, equipped with a telescope through which visitors were to gaze at Jupiter. 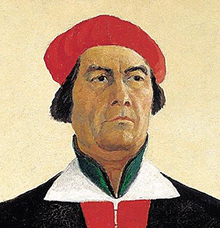 Malevich's family was one of the millions of Poles who lived within the Russian Empire following the Partitions of Poland. Kazimir Malevich was born near Kiev on lands that had previously been part of the Polish-Lithuanian Commonwealth of parents who were ethnic Poles. Both Polish and Russian were native languages of Malevich, who would sign his artwork in the Polish form of his name as Kazimierz Malewicz. In a visa application to travel to France, Malewicz claimed Polish as his nationality. French art historian Andrei Nakov, who re-established Malevich's birth year as 1879 (and not 1878), has argued for restoration of the Polish spelling of Malevich's name. In 2013, Malevich's family in New York City and fans founded the not-for-profit The Rectangular Circle of Friends of Kazimierz Malewicz, whose dedicated goal is to promote awareness of Kazimir's Polish ethnicity. Alfred H. Barr Jr. included several paintings in the groundbreaking exhibition "Cubism and Abstract Art" at the Museum of Modern Art in New York in 1936. In 1939, the Museum of Non-Objective Painting opened in New York, whose founder, Solomon R. Guggenheim—an early and passionate collector of the Russian avant-garde—was inspired by the same aesthetic ideals and spiritual quest that exemplified Malevich’s art. The first U.S. retrospective of Malevich's work in 1973 at the Solomon R. Guggenheim Museum provoked a flood of interest and further intensified his impact on postwar American and European artists. However, most of Malevich’s work and the story of the Russian avant-garde remained under lock and key until Glasnost. In 1989, the Stedelijk Museum in Amsterdam held the West’s first large-scale Malevich retrospective, including its own paintings and works from the collection of Russian art critic Nikolai Khardzhiev. Malevich's works are held in several major art museums, including the State Tretyakov Gallery in Moscow, and in New York, the Museum of Modern Art and the Guggenheim Museum. The Stedelijk Museum in Amsterdam owns 24 Malevich paintings, more than any other museum outside of Russia. Another major collection of Malevich works is held by the State Museum of Contemporary Art in Thessaloniki. On 3 November 2008 a work by Malevich entitled Suprematist Composition from 1916 set the world record for any Russian work of art and any work sold at auction for that year, selling at Sotheby's in New York City for just over US$60 million (surpassing his previous record of US$17 million set in 2000). 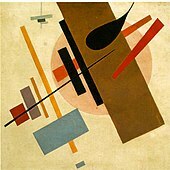 In May 2018, his painting Suprematist Composition sold at Christie's New York for over US$85 million (including fees), a record auction price for a Russian work of art. Malevich's life inspires many references featuring events and the paintings as players. The smuggling of Malevich paintings out of Russia is a key to the plot line of writer Martin Cruz Smith's thriller Red Square. Noah Charney's novel, The Art Thief tells the story of two stolen Malevich White on White paintings, and discusses the implications of Malevich's radical Suprematist compositions on the art world. British artist Keith Coventry has used Malevich's paintings to make comments on modernism, in particular his Estate Paintings. Malevich's work also is featured prominently in the Lars Von Trier film, Melancholia. †† Also known as Black Square and Red Square: Painterly Realism of a Boy with a Knapsack - Color Masses in the Fourth Dimension. ^ a b c Milner and Malevich 1996, p. X; Néret 2003, p. 7; Shatskikh and Schwartz, p. 84. ^ "Malevich, Kasimir, A Dictionary of Twentieth-Century Art". Encyclopedia.com. Retrieved 2014-03-18. ^ "Casimir Malevich, The Columbia Encyclopedia, Sixth Edition". Encyclopedia.com. Retrieved 2014-03-18. 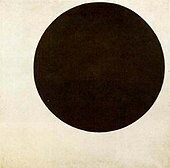 ^ Malevich, Kazimir. The Non-Objective World, Chicago: Theobald, 1959. ^ Chave, Anna. Mark Rothko: Subjects in Abstraction. Yale University Press. p. 191. ^ Hamilton, George. Painting and Sculpture in Europe, 1880-1940, Volume 29. Yale University Press. ^ "Ukrainian Avant Garde". Ukrainian Art Library. ^ Chipp, Herschel B. Theories of Modern Art, Berkeley & Los Angeles: University of California Press, 1968, p. 311-2. ^ Tolstaya, Tatiana. "The Square," New Yorker, June 12, 2015. Retrieved March 21, 2018. ^ de la Croix, Horst and Richard G. Tansey, Gardner's Art Through the Ages, 7th Ed., New York: Harcourt Brace Jovanovich, 1980, p. 826-7. ^ Bezverkhny, Eva. "Malevich in his Milieu," Hyperallergic, July 24, 2014. Retrieved March 21, 2018. ^ a b Wood, Tony. "The man they couldn't hang," The Guardian, May 10, 2000. Retrieved March 21, 2018. ^ "Kazimir Malevich - one of the famous Russian Painters. Biography and interesting facts". ^ "Kazimir Malevich and Ukraine - Ukrainian Art Library". Ukrainian Art Library. 2015-01-24. Retrieved 2016-07-01. ^ a b Andrzej Turowski (2002). Malewicz w Warszawie: Rekonstrukcje i Symulacje [Malevich in Warsaw: Reconstructions and Simulations]. Krakow: Universitas. ISBN 8370524869. Foreword. ^ N.D. (26 July 2013), Walczą o polskość Malewicza (Advocating the Polishness of Malewicz) Nowy Dziennik. ^ a b "Myroslav Shkandrij. Reinterpreting Malevich: Biography, Autobiography, Art // Canadian-American Slavic Studies, Vol. 36. No. 4 (Winter 2002). pp. 405–420" (PDF). Archived from the original (PDF) on 2016-12-13. ^ Liukkonen, Petri. "Kazimir Malevich". Books and Writers (kirjasto.sci.fi). Finland: Kuusankoski Public Library. Archived from the original on 24 August 2014. 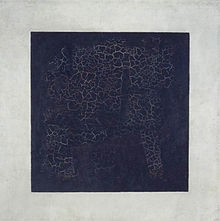 ^ "Malevich, Black Square, 1915, Guggenheim New York, exhibition, 2003-2004". Archive.org. Retrieved 2014-03-18. ^ "Selected Poems with Postscript, 1907–1914". World Digital Library. 1914. Retrieved 2013-09-28. ^ Drutt and Malevich 2003, p. 243. ^ "Hermitage Museum, ''Malevich. Black Square'', Exhibition: 20 June, 2002 - 30 June, 2003". Hermitagemuseum.org. Retrieved 2014-03-18. ^ Julia Bekman Chadaga (2000). Conference paper, "Art, Technology, and Modernity in Russia and Eastern Europe". Columbia University, 2000. "the Suprematist is associated with a series of aerial views rendering the familiar landscape into an abstraction…"
^ "Kazimir Malevich: the Ukrainian roots of his avant-garde art". Day.kiev.ua. 2011-12-27. Retrieved 2014-03-18. ^ "The Art World: Kazimir Malevich and Ukraine". Zoryafineart.com. 2004-04-11. Retrieved 2014-03-18. ^ "Socialist Realism | art". Encyclopedia Britannica. Retrieved 2018-10-15. ^ a b Cole, Thomas B. (16 March 2011). "Spring". JAMA. 305 (11): 1066–1066. doi:10.1001/jama.2011.280. Retrieved 8 August 2017 – via jama.jamanetwork.com. ^ "The Collection | Suprematism". MoMA. Retrieved 2014-03-18. ^ a b c "Историк: "В некоторых анкетах 1920-х годов в графе "национальность" Казимир Малевич писал: украинец"". Українська правда _Життя. Retrieved 2019-02-23. ^ Schjehldahl, Peter. "The Prophet: Malevich's Revolution". The New Yorker. Retrieved 15 May 2015. ^ a b Sophia Kishkovsky (August 30, 2013), Malevich’s Burial Site Is Found, Underneath Housing Development The New York Times. ^ a b c "Walczą o polskość Malewicza". Retrieved 8 August 2017. ^ a b Malevich and the American Legacy, March 3 - April 30, 2011 Gagosian Gallery, New York. ^ a b Sophia Kishkovsky (July 18, 2002). "From a Crate of Potatoes, a Noteworthy Gift Emerges". The New York Times. Retrieved 2009-08-23. ^ a b "Co-operation With the State Hermitage Museum". State Hermitage Museum. Archived from the original on 2009-10-06. Retrieved 2009-08-23.